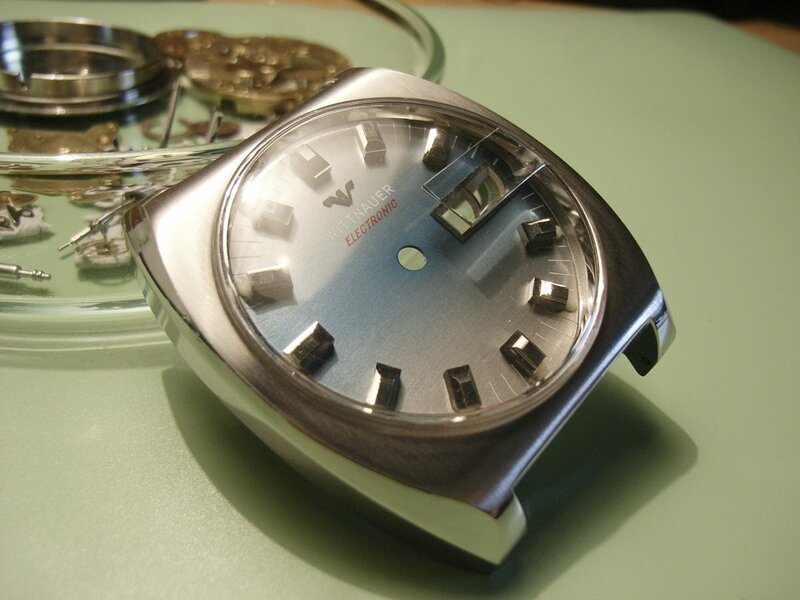 Here the revision of another watch with a movement from the notable ESA Dynotron series - a Wittnauer Electronic with an ESA 9158 day-date movement. 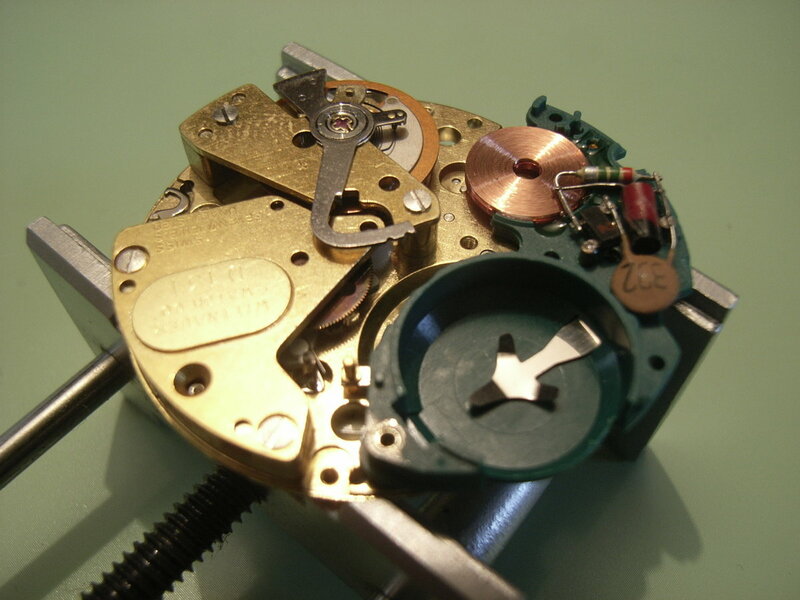 I already finished this project more than two years ago, but as there are almost no detailed infos on this movement I thought I´ll give it some "internet time". 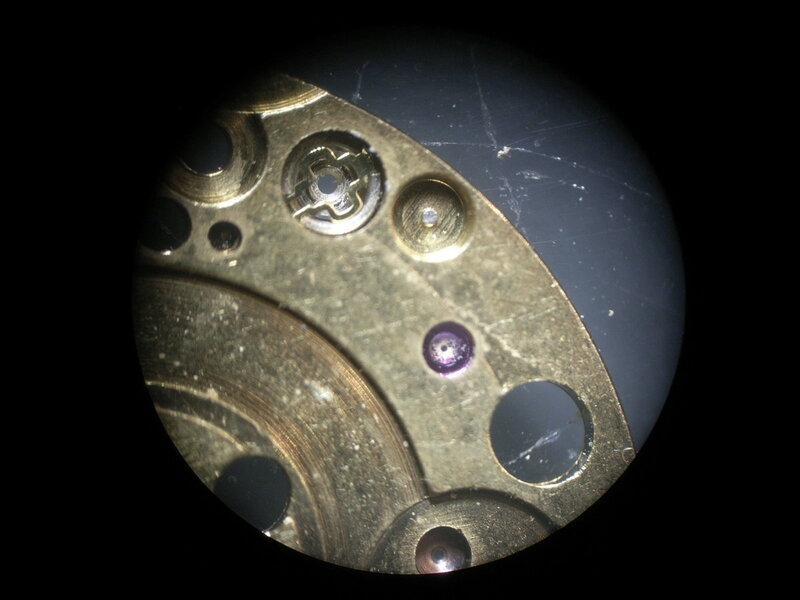 Ancient greenish oil - check. 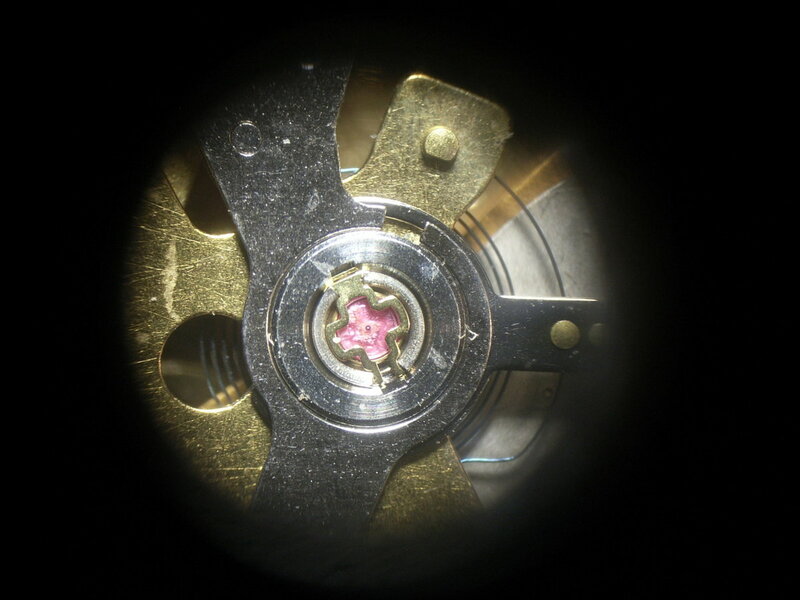 Rests of dried oil in the jewel bearings of the balance wheel - check. Some rust under the old gasket. 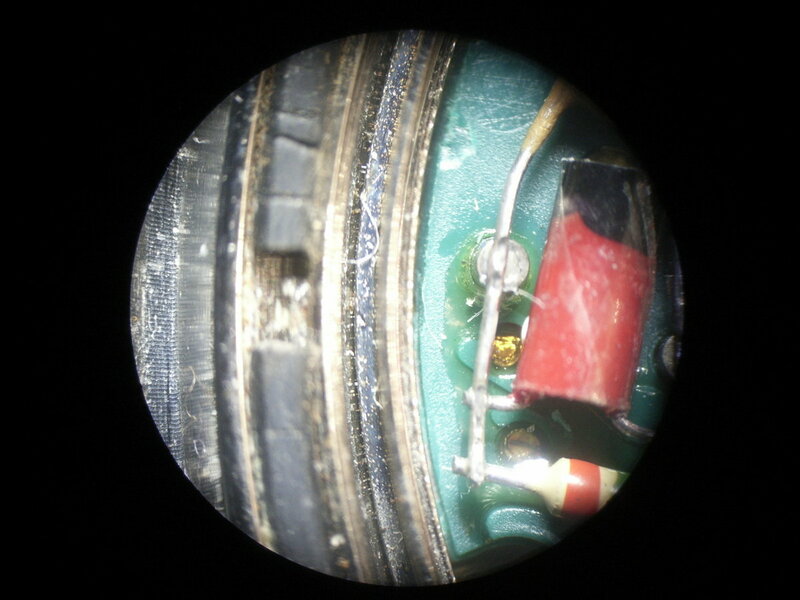 The slide-out electronic part of the movement (btw: I found the ESA 9158 to be even more repair-friendly than the already great earlier Dynotrons). 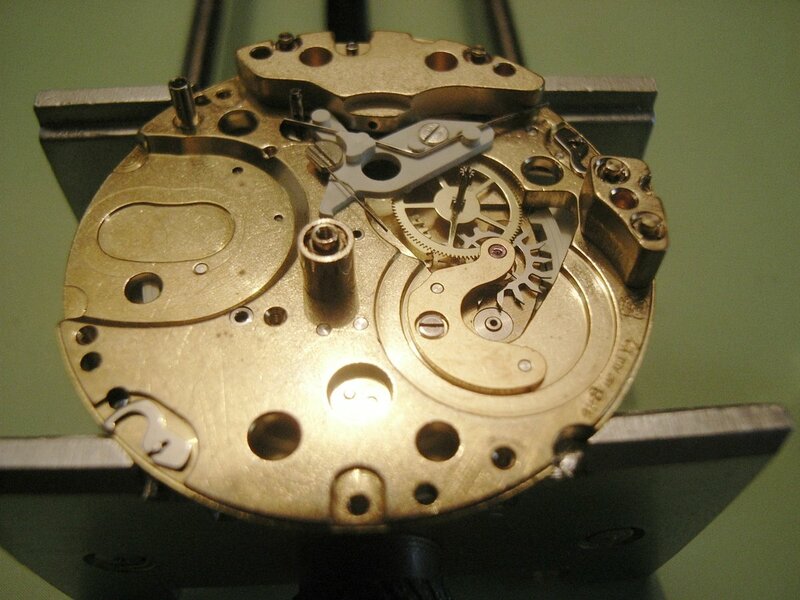 The balance wheel and its bridge are held in place by two screws instead of only one as in most other watches. 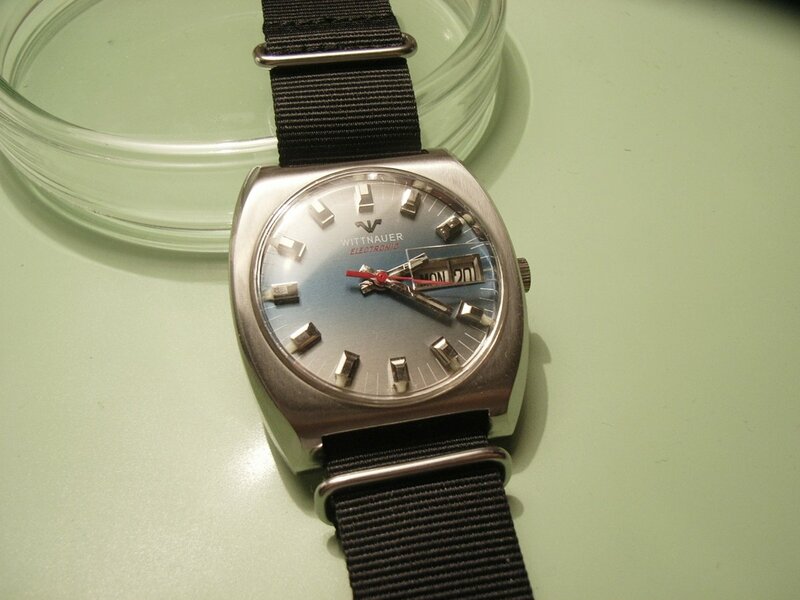 The long arm for regulating the balance - it is a somewhat cheaper and less-accurate solution in comparison with earlier Dynotron versions. 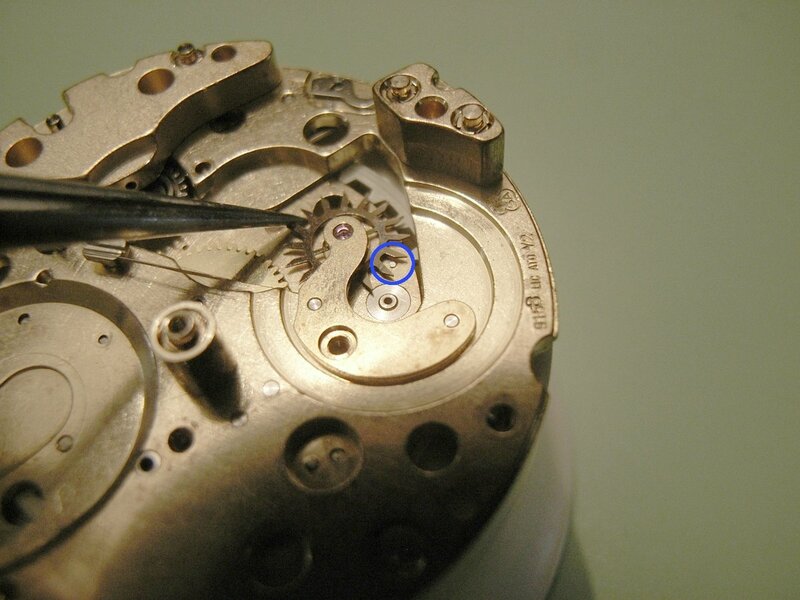 In contrast to the preceding Dynotron movements, anchor and a conventional escape wheel were omitted in the 9158. After removal of the wheel train bridge and some wheels. 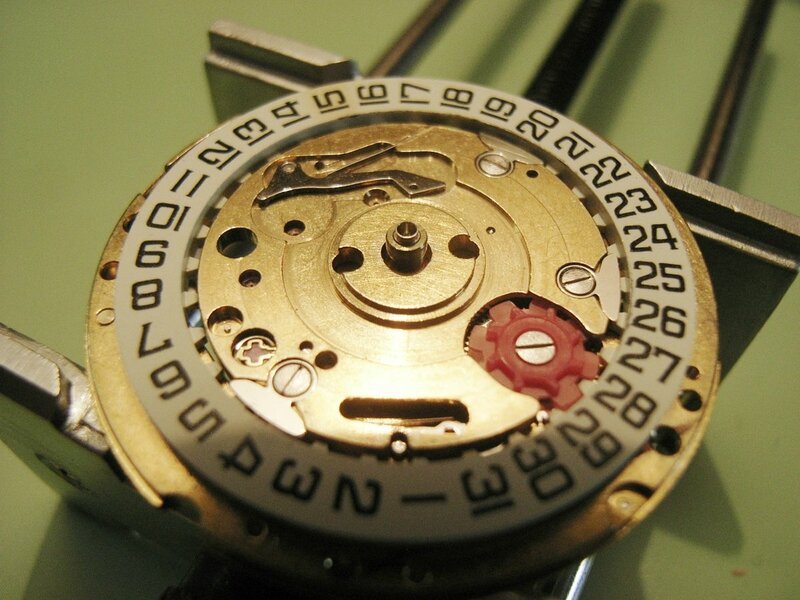 The movement even allows for quick-setting day and date which makes it the most feature-rich Dynotron movement. 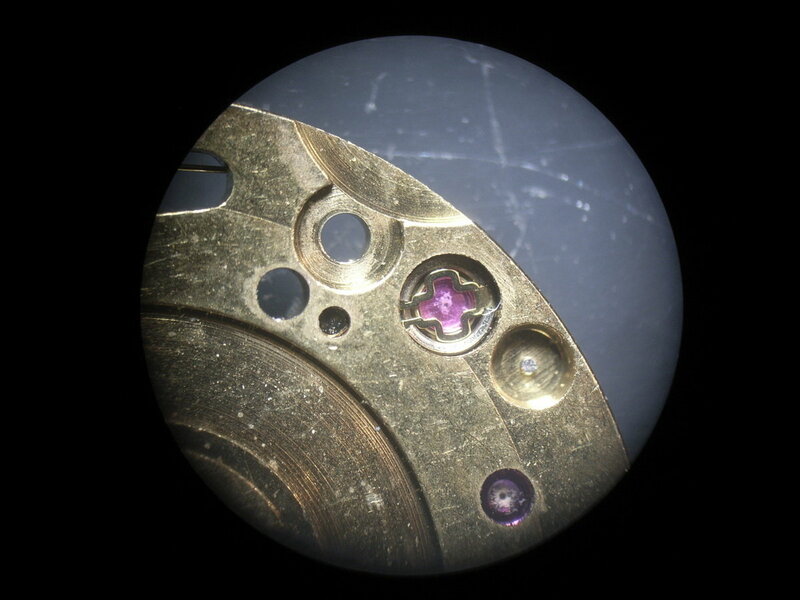 Above a look under the day disc. 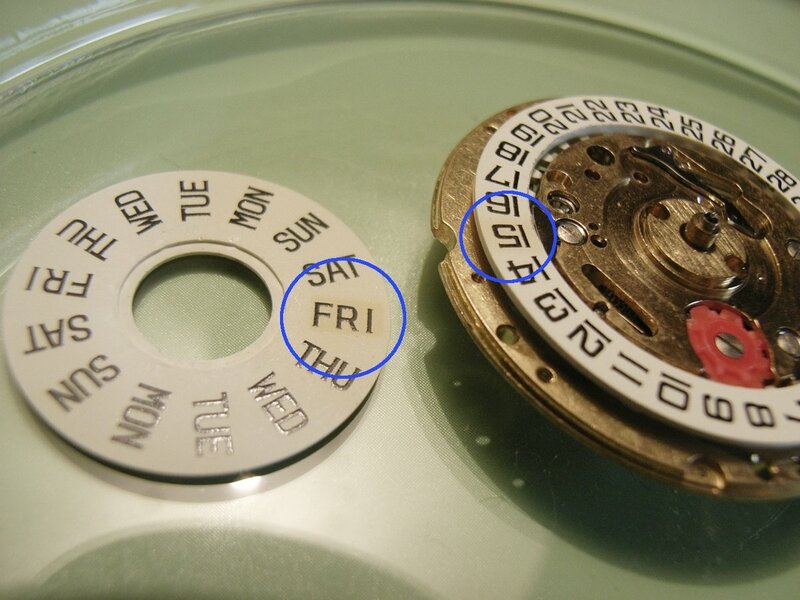 The red wheel switches either day and date. 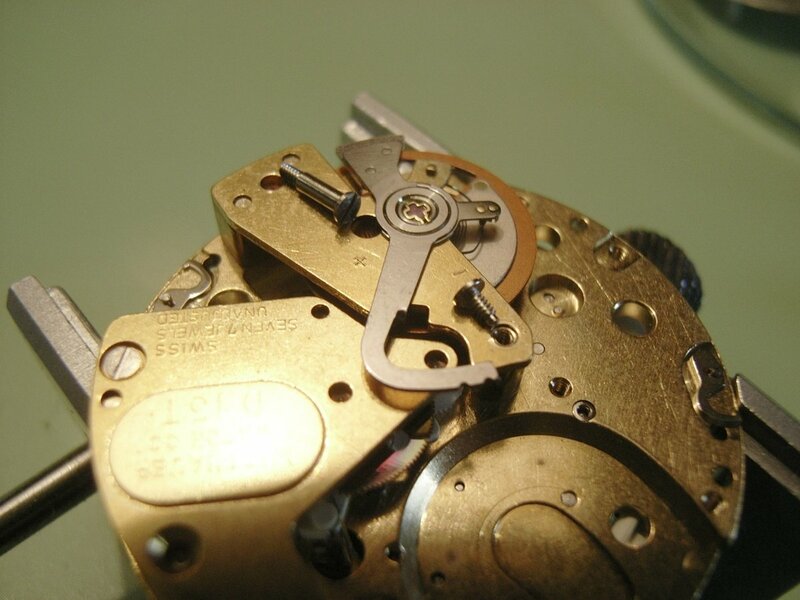 A look on the keyless and motion works. 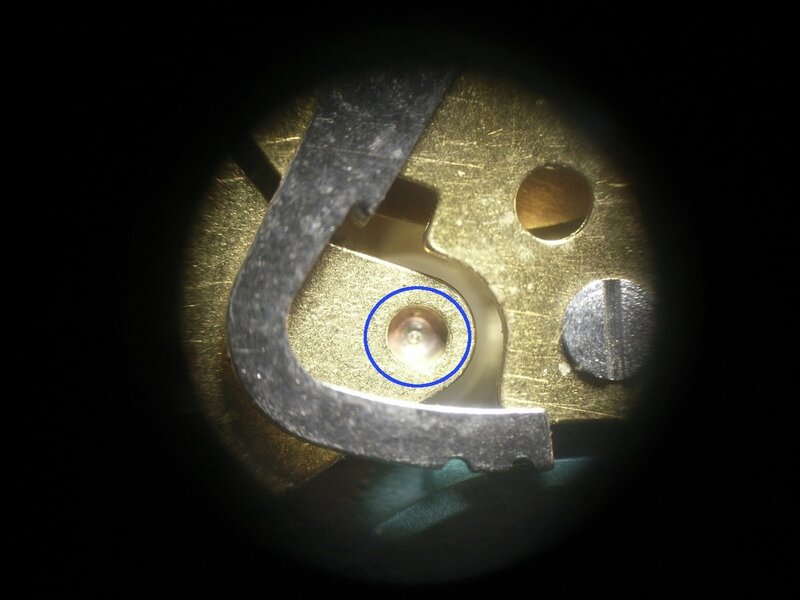 The dial side bearings of the balance and escape wheel with dried oil. 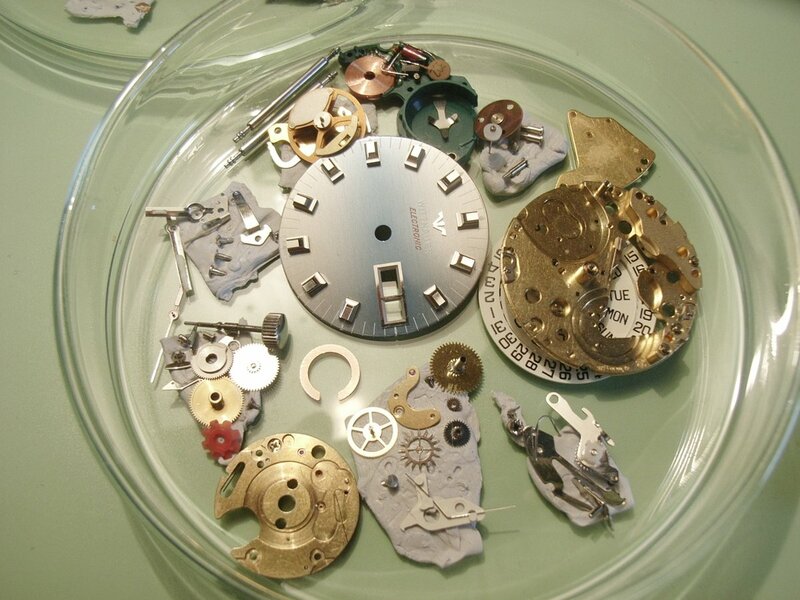 The completely disassembled watch before cleaning. 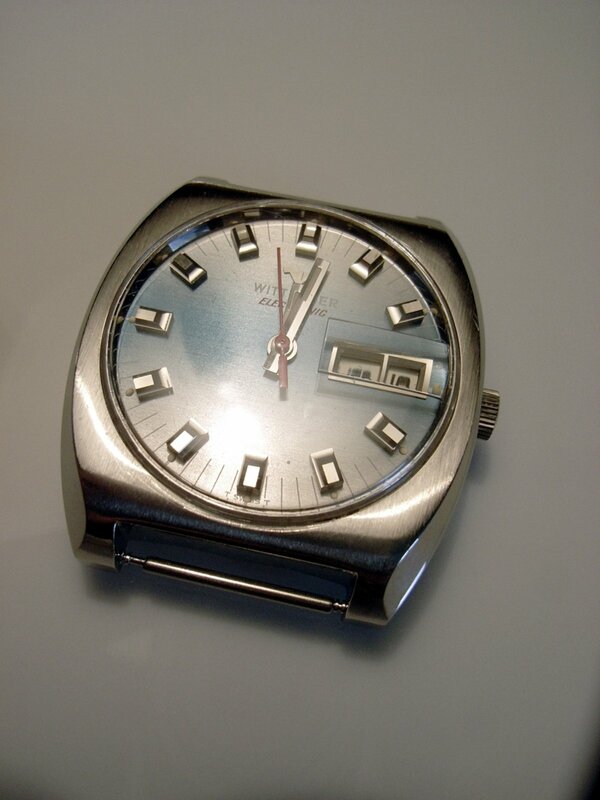 The slightly polished case and crystal as well as the dial with renewed luminous markers. 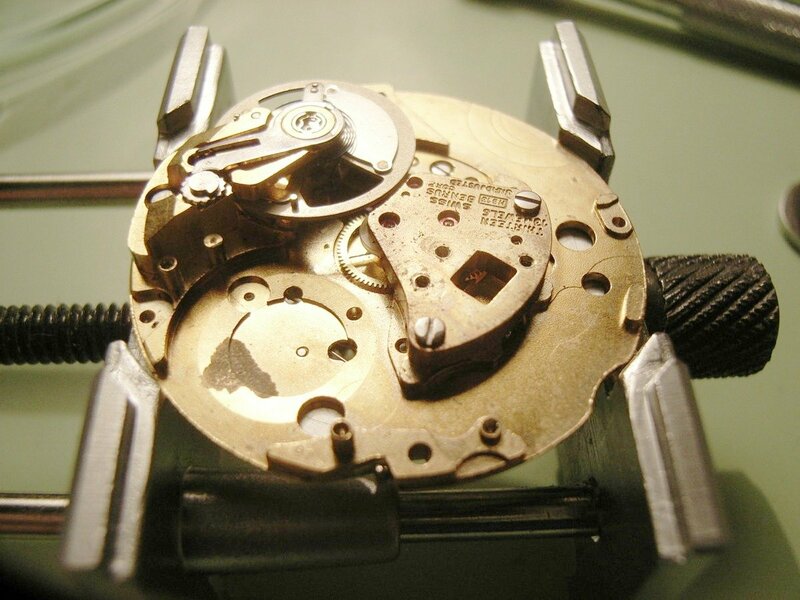 The electronically-driven balance wheel is also the motor of the movement - so this is where the motion of the hands actually starts. 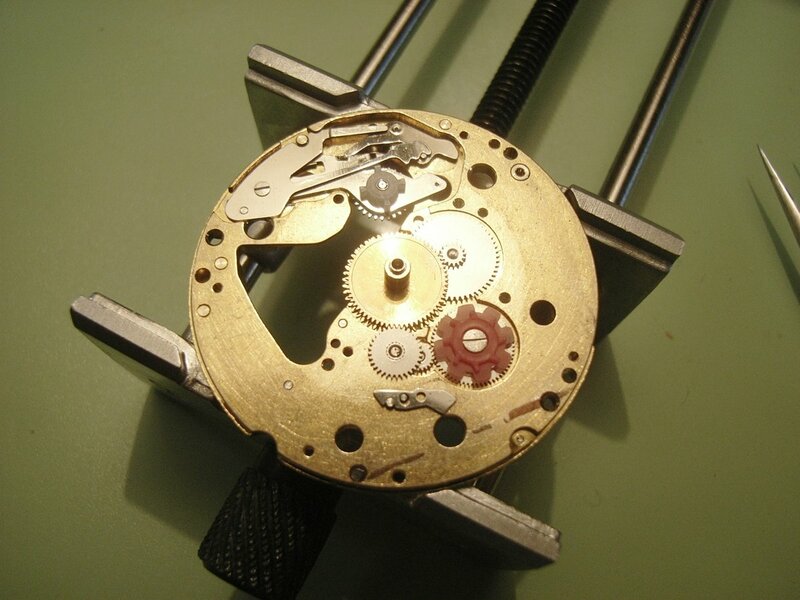 The form of the escape wheel (for my current lack of a more precise term) converts the bi-directional balance movement into an uni-directional movement. 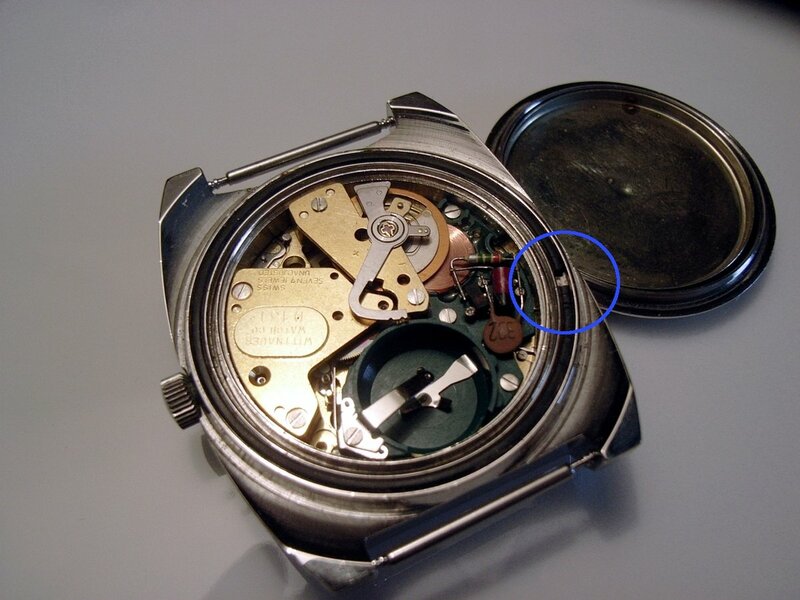 To prevent the escape wheel from turning backwards there is a small permanent magnet under one of its teeth (blue circle, do not demagnetize the movement!). 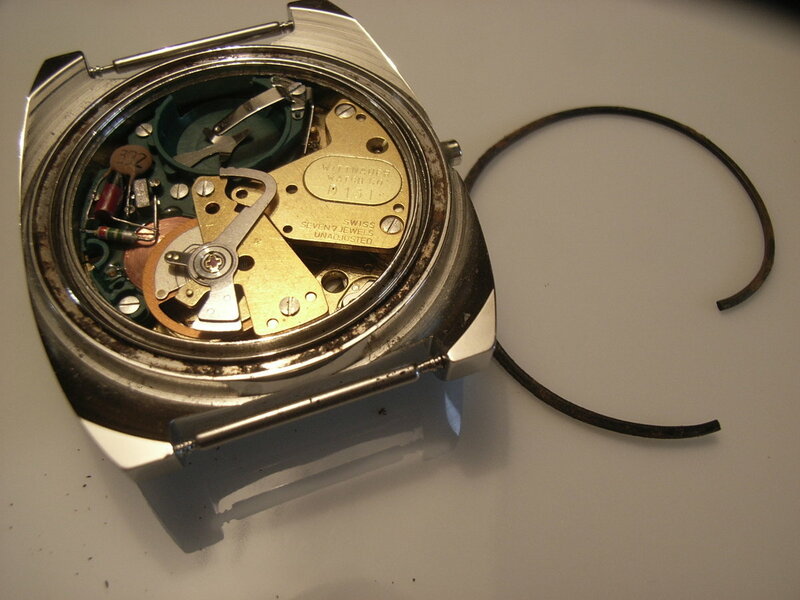 The finished movement back in its case (with somewhat too much gasket grease...I corrected for this later). 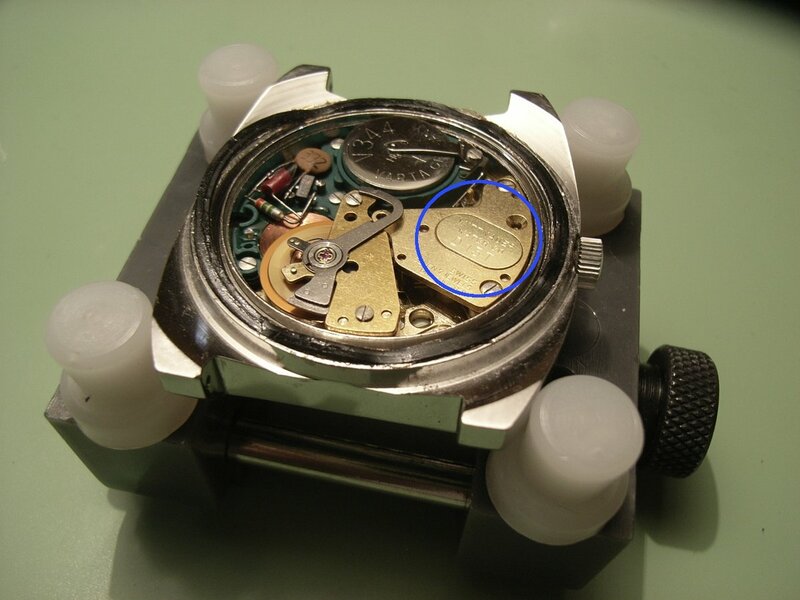 As the ESA 9158 was used in many watches at that time, ESA had provided a field to place a company-specific inlay (here it says "WITTNAUER WATCH CO D13T"). 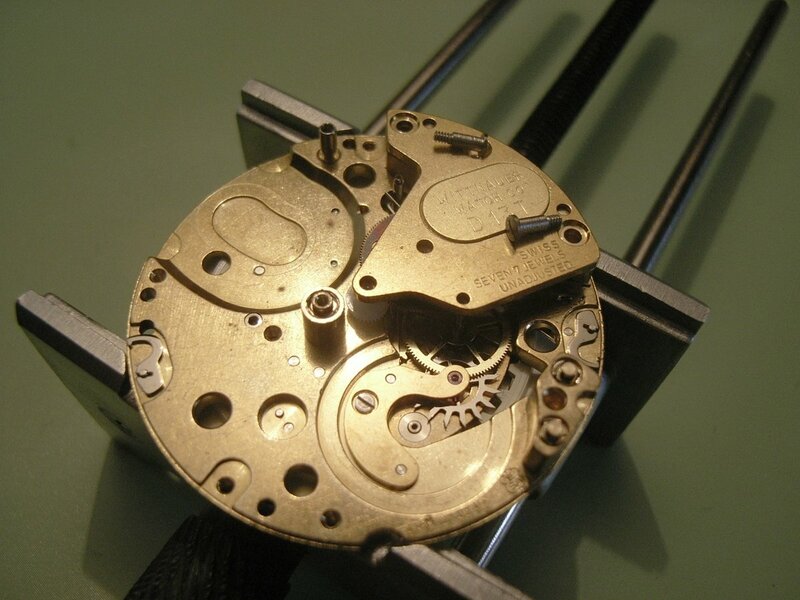 The finished watch - it looks great and runs quite perfect (only a few seconds deviation a week which also shows why this movement was considered to be usable in chronometer-grade watches). 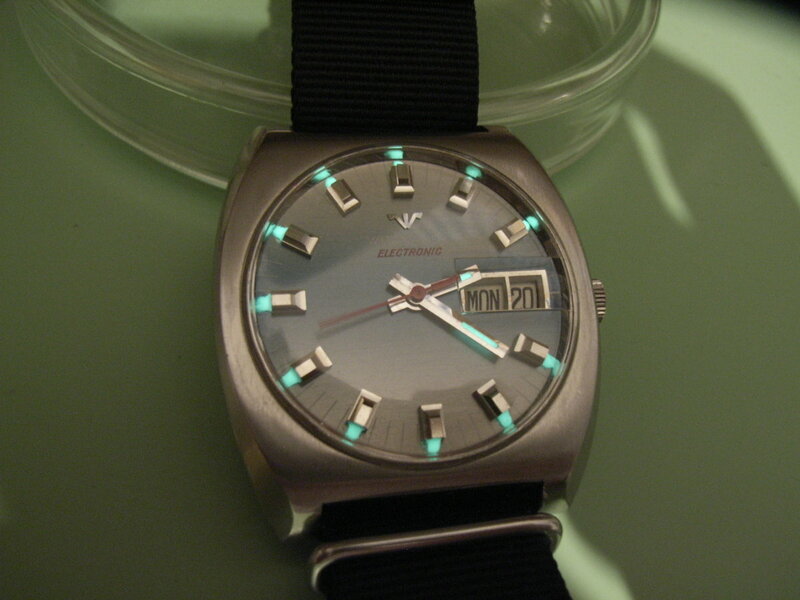 And a last photo to show you the Wittnauer´s looks under low-light conditions.